We achieved our maximum possible score of 385 in the semifinals! However, that wasn't enough to top the amazing robots of the 1st place Flying Geeks and 2nd place Nano Hogs. Congrats to them on their fantastic robots. Our first table run in the Official Performance Rounds was a 405-point run. In conjunction with a later 400-point run, our robot earned the First Place Performance Award. 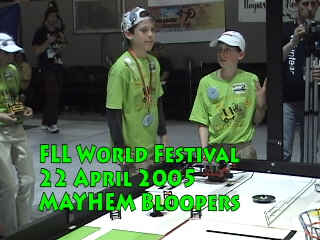 Lest anyone think our robot is always perfect, here are some of the "Mayhem Moments" at the World Festival. 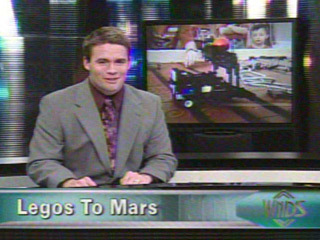 This segment, "Legos to Mars," is from the WNDS evening news on Feb 19, 2004, when we were preparing for the FLL International Invitational Tournament. 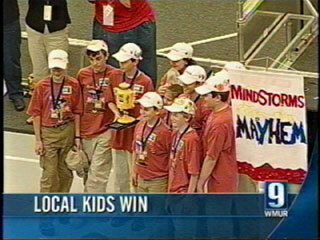 This segment, "Lego Payoff / Local Kids Win," is from the WMUR evening news on Apr. 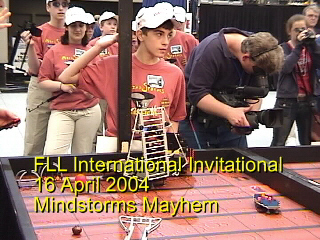 30, 2004, after we were awarded the Director's Award at the FLL International Invitational Tournament . At the FLL International Invitational, we had hoped to repeat the "perfect run" that we experienced in a local tournament. However, that "perfect run" eluded us -- in our three performance rounds, we experienced one different problem each time. Through the magic of combining together different runs, here is the "run we wish we had..."
Our traditional "giveaway item" has been superballs. 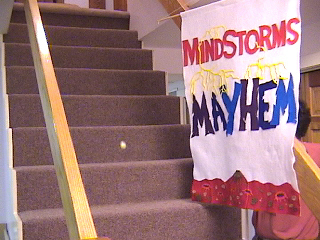 Have you ever wondered what one thousand superballs bouncing down the stairs would look like? If so, you don't need to wonder any longer! 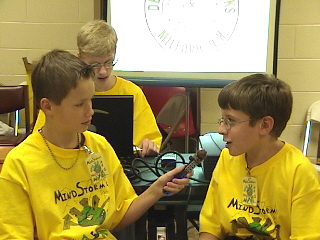 This clip is of our research presentation for 2002's City Sights Challenge. Our Table run in the State Semi-Finals. Our robot ran a perfect run worth 360 points. 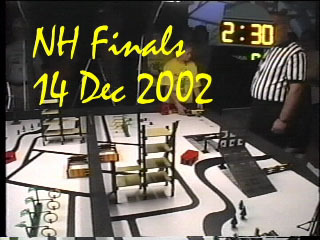 The NH State Finals. With help from the other team, we were able to get 392 points in this run. That was the best possible score last year!